Before diving in to this subject, it’s important to understand all that diversity entails. Ethnic differences are often the first thing that comes to mind when people hear the term diversity. Diversity does include varying races and ethnicities and it will be the standard for meetings as we move into the future. As Skift reminds us, “Multicultural Meetings and Events Will Be Key as Minorities Become the Majority” by 2040. However, diversity is so much more than just that. It includes people of varying religions, ages, genders and sexual orientations as well as those with varying degrees of physical and mental disabilities. Almost every population is diverse in some way. While it is important, it can still be overwhelming to try to figure out how to keep diversity top of mind throughout the planning process. Today, we bust three myths that could be standing in the way of planning a truly inclusive meeting. Planners have budgets by which to abide and are often tasked with doing a lot on very little funding, while still trying to raise money for their organization. While you can dedicate funds to planning a more inclusive meeting, there are also a few cost-effective ways to ensure everyone feels welcome. For example, the city chosen for a meeting should be one that is welcoming and open to all people. Set up free Google alerts for any city that you’re considering for an upcoming event, so you can stay up-to-date on any discriminatory legislation or events that may make a city unsafe for any of your attendees. During the site selection process, you can also have those cities show you facilities that have existing inclusive spaces, such as nursing mother’s rooms or gender-neutral bathrooms, so you can choose those up front and not have to worry about an extra fee from a facility in which you would have to find extra space to create these accommodations. Additionally, budgets are already being used on speakers and panels, so mindfully crafting your programming roster is one way to ensure more diversity without adding expenses. Use the backlash from last year’s SJ Magazine Women’s Empowerment Series panel that featured all men as a cautionary tale, and check out this piece from Slate on how to diversify all-male panels, which is applicable to any non-diverse group. To accompany these speakers and panels, work with a local college to see if you can offer internship or class credit for an interpreter to be on site during your meeting. 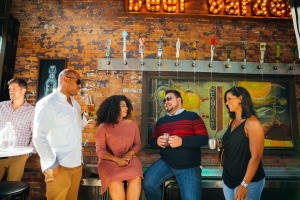 Keep in mind, the more inclusive a meeting is, the more people are likely attend, which will help increase profits from registration and lead to bigger budgets that can be used for more expensive inclusive practices such expanded F&B offerings. You can’t just slap a photo of a diverse group on a registration email and think that’s all you need to appease and attract a diverse audience. Yes, members and attendees want to see someone who looks like them in marketing materials, however, it’s important that said materials reflect the true essence of a meeting. So, if someone chooses to attend your meeting because of the diversity in your marketing imagery, they will be upset if they don’t actually find someone else who looks like them either in attendance or presenting. Work first on making internal changes that attract a more diverse audience. Over time you can announce those via blog posts, press releases and e-mail blasts so there is still something tangible, then once the internal work is done, update all photos to portray an accurate representation of your organization’s diversity. While this statement is probably true, the myth is that you have to do it alone. Use the people around you as resources for ideas and deputize them to be agents of change. Instead of starting with a blank slate and trying to brainstorm new ideas for inclusive meetings, survey your participants to find out where there are gaps. It’s easy (and free) to add an additional question or two to your post-show survey to ask attendees if they felt fully included and if not, what they’d like to see at the next meeting. You can also use your existing membership and attendee bases to create volunteer committees to help do some of the work for you, such as planning menus that cater to a wider variety of food preferences or recommending speakers with more diverse backgrounds. In today’s modern world, there’s no reason diversity should not be top of mind throughout the planning process. All meetings should be inclusive and continue to innovate new ways to be more so. In Columbus, a city that continually scores a perfect 100 on the Human Rights Campaign’s Municipal Equality Index, we know a thing or two about being smart, open and welcoming. The Greater Columbus Convention Center also offers many amenities and resources that cater to people of all backgrounds and needs. 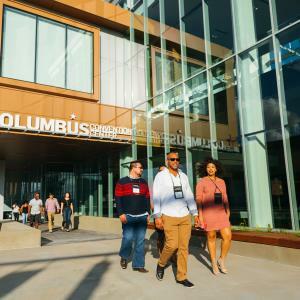 Diverse panelists and speakers are easy to find in Columbus, and with the city’s large variety of entertainment and dining, any visiting meetings audience is sure to find something that appeals to them. Let us know where you’re getting stuck and let’s see if we can come up with a solution that works for all of your attendees.